Are Catholics in conspiracy with Pagan Muslims who Worship the Crescent Moon? Does Islam worship the same God as Christians? Why the heck is the Catholic Church saying "together with us" about the Muslims? Does the Catholic Church think that non-Christians can get into heaven? Line 841 of the Catholic catechism ... seems to contradict Jesus himself. It states that the plan of salvation includes the Moslems, because they worship the same God as the Jews and Christians. ...I live near a Mosque - every one of them has a crescent moon on top. ...Over the centuries, the Moslem cult has ascribed the virtues of the one true God on their moon God, claiming that our God was the moon god all along. ...The God of the Moslems is the Babylonian moon god. The God of Abraham is NOT the Babylonian moon god. They worship a false god and a false prophet....That line seems to claim that the Moslems are saved because of their belief in the God of Abraham. Jesus himself said that he is the way, the truth, and the life, that nobody comes to the Father except through him. He also said that anybody attempting to come to the Father another way is like a thief or a robber. Surely - this line is not saying that the Moslems are saved? That would be an abomination! Neither the Moslems nor the Jews could be saved solely by belief in the God of Abraham. They must come to a saving knowledge of Jesus Christ - or be forever separated from God. The first question is "what is the plan of salvation?" We believe it is that all peoples would come to know God through our Lord and Saviour Jesus Christ. (Mat 28:19) Therefore all people are part of God's plan for salvation. They are to be evangelized in the name of Jesus. There is nothing biblically incorrect about the Catechism saying we should carry that message of salvation to Muslims and include them in that plan of salvation. 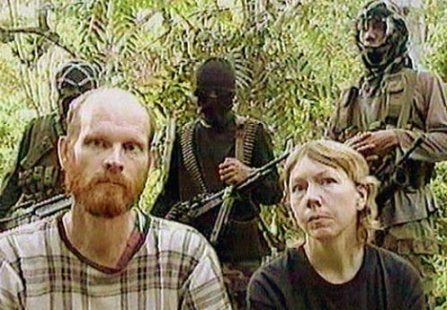 Martin and Gracia Burnham were Bible believing Evangelical Christian missionaries (not Catholic) who were captured by Islam terrorists in Indonesia and held for over a year. This husband and wife team spent over a year living with Islam extremists. The wife, Gracia Burnham was rescued by Indonesian police after a year. She sustained a gunshot wound and the husband was shot to death in the crossfire of the battle. The following is an excerpt that helps get inside the Muslim mind. Interviewer: Did you learn anything about ministering to Muslims that might be helpful to others? And they (Muslims) went on and on and we came to believe that we were talking about the same God we Christians worship, Jehovah. Then one day they were talking about the names of God that show his different characteristics. He's merciful, and all these different things. I asked if one of the names for their God was love. Does Allah love you? And you could see him thinking and he said, "No, Allah doesn't love us and we're not asked to love Allah. We just worship him because he's the true creator." So I told Martin, with a god who doesn't love you, this is where that religion leads, to something like this. If I started teaching Muslims, I would teach the characteristics of God, the ones they already know and then say, "Here's one you haven't been taught: God is love." And give them the Old Testament Scriptures that talk of His love. They're very agreeable to talk about the Old Testament Scriptures. They know all about Noah and David and Adam and they call them the prophets. So they'll listen to you talk about the Old Testament and there are plenty of verses that talk about God loving us. They've just been deceived in their concepts of God. That's what New Tribes Mission always taught us: when you go into an area, try to use their name for God unless he's just totally different. Interviewer: It's interesting that they would know John 3:16 without the concept of love coming into it. GB: It blew me away. One of them, Solaiman, would say to me, Islam is a religion of justice and we're going to get justice for everything bad that has happened to Muslims and he would go back to the Crusades and on up. And we told him that Christianity is a religion of mercy. We know that we've sinned. And that's another thing about Muslims. Their concept of sin is like ours. God won't tolerate it. They know that everyone has sinned. I remember saying to him one day, "We need somebody to show us mercy because we've sinned. Somebody's got to pay for our sin or we're going to have to. And that's what Jesus did. Jesus paid for our sins so they're removed and we don't have to bear that debt anymore and we're not going to be judged by our sinfulness." Solaiman got this sneer on his face and said, "Where's the justice in that? I'm going to pay for my own sins." And we were so sad when we went to bed that night and Martin said, "That's exactly what's going to happen. Solaiman's going to pay for his own sins and it won't be a pretty sight." Muslims messed up on the key quality of God, God's love. But the Muslims clearly believe that God created the universe. If God created the universe then God created the moon. And if the moon is a creation of God then it cannot be God. The Muslims believe in one God unlike the Babylonians who believed in many gods. [people who make the crescent moon accusation] engage into the logical fallacy of equivocation, that since Muslims use the crescent as the symbol of Islam, therefore it follows that Muslims worship some kind of "moon deity". This is no truer than claiming that since Judaism adopts the Star of Hugh symbol, it follows that the Jews considers it as an object for worship, or that Christians worship the Crucifix since it is used as its symbol. Why the heck is the Catholic Church saying "together with us" about the Muslims ? The Church finds it a profound responsibility to evangelize the Muslims. It realizes it cannot evangelize by war. It must make peace with them to the extent possible. It must reach across social and cultural barriers. The Church finds no evidence that they are worshiping a different God. After the Jews, the Muslims have the closest relationship to Christian beliefs of any other religion. It is useful to leverage this commonality during the evangelization process. To deny that would put us at a supreme disadvantage because Muslims would see our ignorance. We must do like the Missionaries who were kidnapped (in the interview above), we must find the common ground and work from there. They believe in the same God as us so let's start there. They don't understand the Love of God because they don't understand Jesus. We must show them the Love of Jesus. We will not do this by conquering them by force. That is the lesson of the Crusades. In order to understand Catechism Verse 841 of the Catechism we must look at its context. This verse follows a long discussion in the Catechism about the Church's relationship to all people of the world. Verses 836-833 speak about Christians who are the Body of Christ. This includes Catholics, Evangelicals, Orthodox Christians and all who profess that "Jesus is Lord." If the Catholic Church believed Muslims were worshipping a different God then the Muslims would be included in verse 844 of the Catechism [category (3)] above. But there is no evidence that they worship a different God. That is why Catholics can say "together with us" in Verse 841 of the Catechism. The Church has never condoned worship of foreign gods and the martyrs throughout history (including the first centuries) died to protect against this. Six verses after the discussion of Muslims, the Catechism concludes this section and makes it clear that those who refuse Jesus will perish (846). Does the Catholic Church think that non Christians can get into heaven? The Catechism makes it clear " they could not be saved who, knowing that the Catholic Church was founded as necessary by God through Christ, would refuse either to enter it or to remain in it." (Cat 846) This is only 5 paragraphs past the discussion of the need to pray for Muslims. Does that mean only card carrying Christians will will enter Heaven? We have an in depth in the article "Are non-Christians saved?". We find no justification for the Fundamentalist accusation that Catholics are in theological conspiracy against the Gospel of Christ with Muslims. It is completely unfounded, unscriptural, and unhistorical. Is Mary is the pagan goddess Gaia (Mother Earth Goddess)? Is the Catholic Church Pagan?